I’ve been making some changes in my living room in an effort to give it a bit of an updated look. My goal was to do it without buying new furniture or repainting the walls. Seems like it took me forever, but I finally finished…for now that is! I apologize for the lighting in some of these pics. This is such a hard room to photograph. The only time the room isn’t dark is when the morning sun streams in through the front door and then it’s blinding in pics! You can see that I made some new pillows for the loveseat. I love mixing unexpected patterns and colors within a room and pillows are such an easy way to do that. The mix of patterns on the love seat helps to draw the eye away from the upholstery that I no longer love. It’s just a fluke that the fabric that I used on the red pillows mimics the stencil that I used on the back of the bookcases. You can see more about the bookcase transformation here. 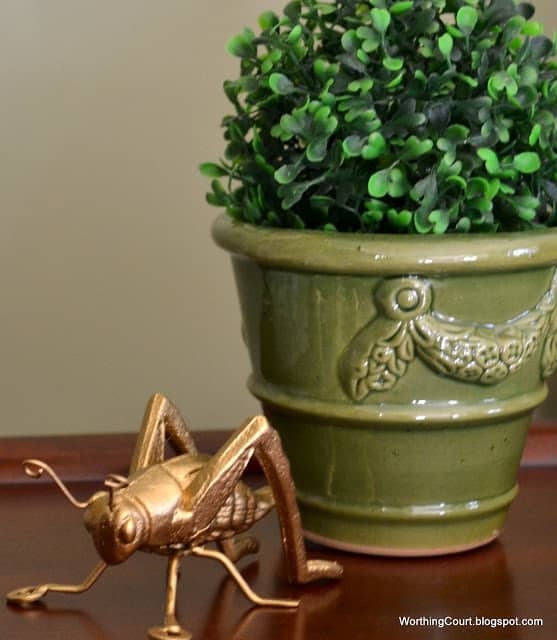 I also replaced the lamp on the little table to the left of the loveseat and added a cute little cricket that I painted gold. 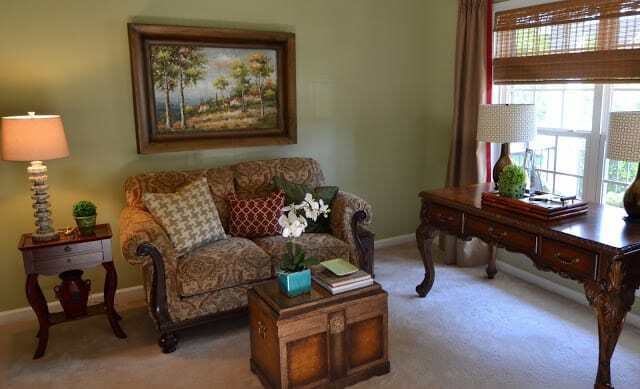 An orchid in a turquoise pot was added to the trunk that serves as a coffe table in an effort to pick up the blue in the picture hanging above the loveseat. I have plans to move that picture somewhere else in the house, but that’s for another day! UPDATE: Click HERE to see the new home for the picture. Here’s the little cricket. Isn’t he cute? 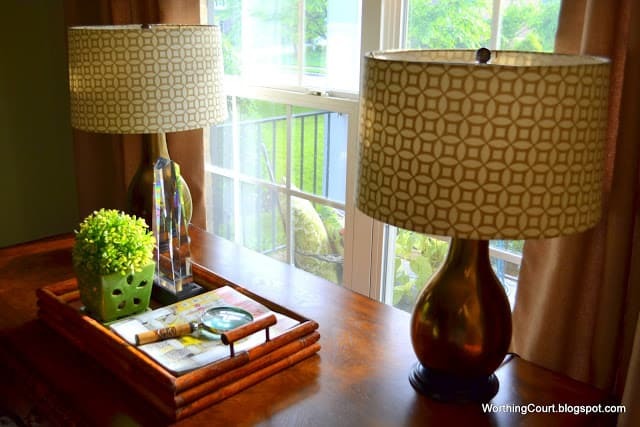 I changed the lamps and the vignette on the table in front of the windows. You can read more about that here. There’s been another change in this area too. Can you spot what it is? Can’t see it? Look at the before and after of this same area. Obviously, I removed the flag pendants from the drapery panels. What may not be so obvious is that I narrowed each one of the panels by about 18″ and also added a deep red ribbon trim to the leading edge of each panel. I showed you the copycat accent table that I added a couple of weeks ago. It sure does help to fill that awkward corner. Here’s how the entire room looks now. …and the whole room all in one shot. I absolutely love your sofa and chair. And cherry wood is my favorite. I love the nice long table at your window! Hey Suzy…love your new additions and changes to the window treatments, etc…It’s amazing what several new touches and tweaks can transform a room….fabulous job..and hey…i love the bold houndstooth fabric! Hi Suzy, Love the new look in the LR. Love the border on the drapes and you took the swags off the panels. Has an updated and clean look! BTW, I love those drapes and that desk. Looks beautiful, Suzy! 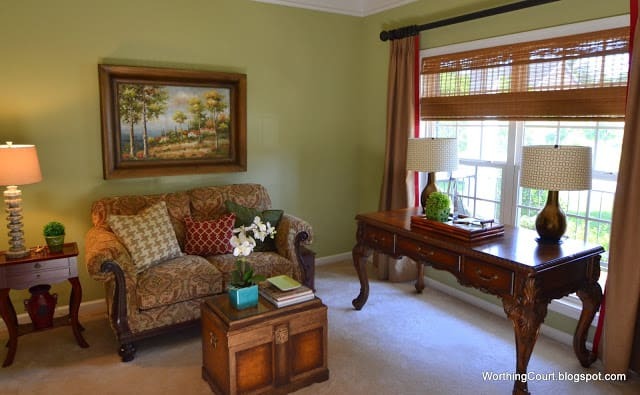 The drapes are fabulous … love your vignettes … the petite table by the chair and the overall wonderful feel of your space! It looks so pretty! 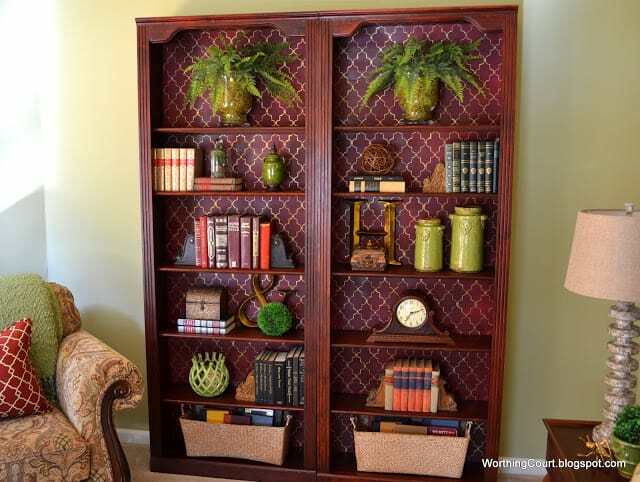 I love the stencil on your bookcases! Gorgeous! Looks amazing!..Your hard work shows,love this,thanks for sharing! What a cozy and pretty room. Very pretty! 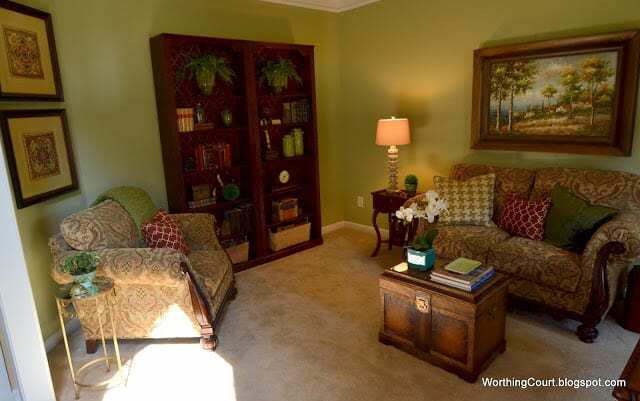 Love the wall color — I seem to be on a green binge lately. I love the vignette on the table by the window with the matching lamps, the gorgeous stencilled design on the back of the bookshelves, and the pretty new cushions you added. Your living room looks great. 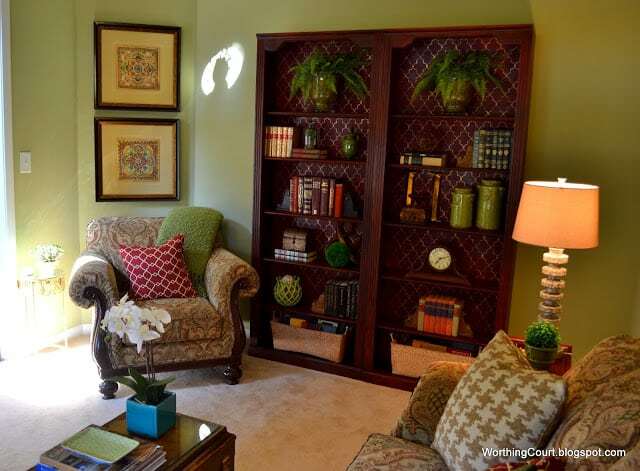 Love the stenciled bookcases! Everything comes together to make such a relaxing looking room. I love the color scheme in this room. 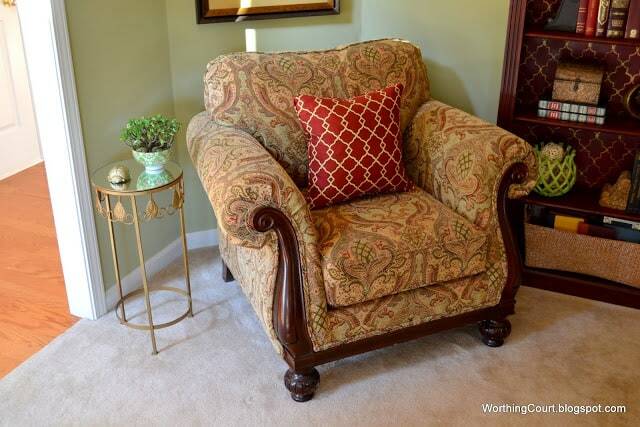 And I really like the upholstered furniture. The drapes look great with the touch of red ribbon. All the details tie it together nicely!! Love the pops of green. A really chic room…so refreshing for me to see a home I can relate to…..you know, cathedral ceiling family room, good furniture etc. and still adding pops of “up to date” stuff with lamps etc. Great job! So lovely! It looks inviting and offering a warm and cozy feeling. 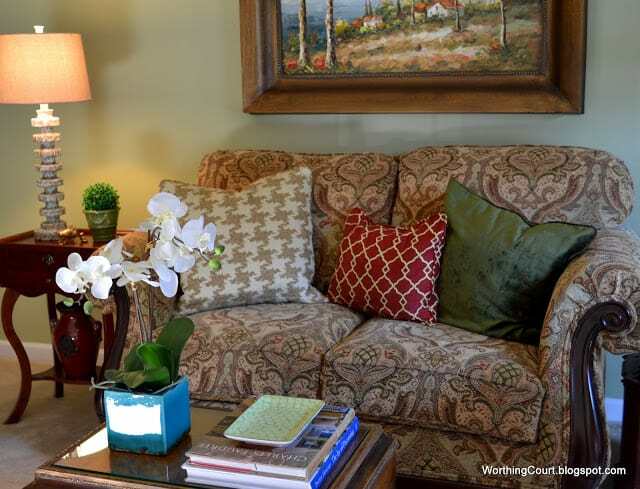 Suzy your patterned pillows make your sofa extra inviting! I just love the eclectic patterns and textures. Your lamp sades are stunning! It looks so cozy and inviting, Suzy. Great pillows that you added! I like your warm colors and the different patterns you use on your pillows! Very cozy, elegant and eclectic, as well! Great job!!! Your living room is wonderful. 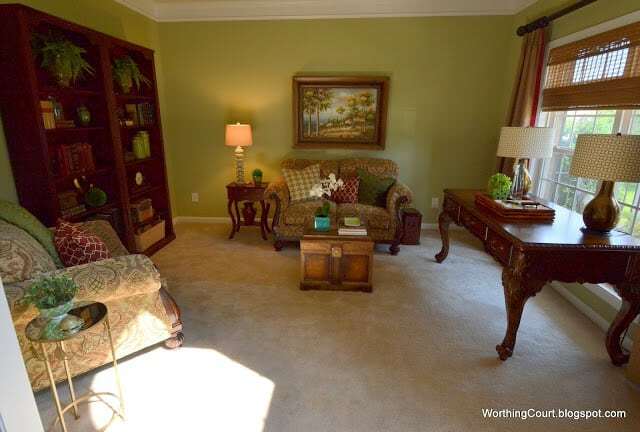 I especially like the sofas and the writing table is beautiful. I was looking back at the blog on your beach house. The bedroom fabrics are just the colors I need because the blues don’t look too aqua-toned. Would you share with me the fabric used for the bed and dust ruffle? Hi Connie. I bought the fabric a few years ago at a local close-out type fabric store. The mill name isn’t on the selvage so I can’t even tell you who made it. 🙁 So sorry! How much do you need? I think I have some leftover that I could sell to you if you’re interested in pillows or something. Such a comfortable warm look. 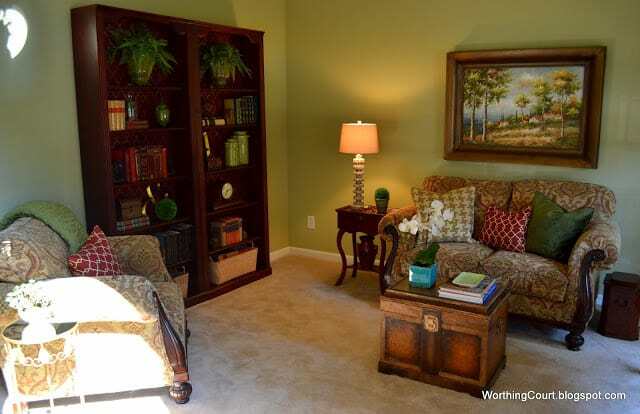 I especially like the treatment to the bookcases. Thanks for sharing this week. 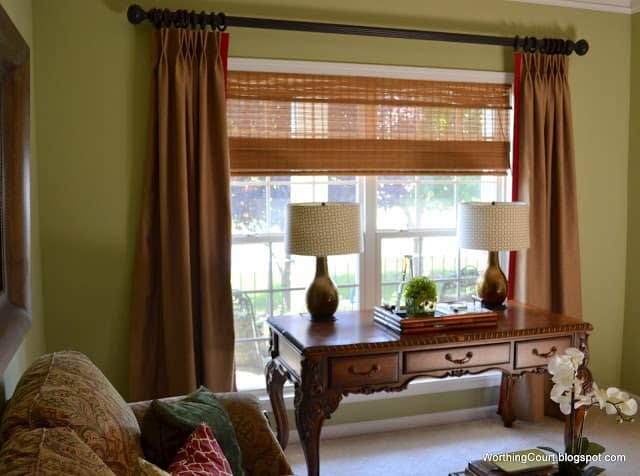 Your living room window treatments look amazing! Great pillows, and that cricket is super cute. Thanks Suzy for joining in on the party. I am just so happy to see all my oldies but goodies again.